24 cm xiv, 302 p. : ill. This Text-book traces the evolution of the newspaper, documenting its changing form, style and content as well as identifying the different roles ascribed to it by audiences, government and other social institutions. Starting with the early 17th century, when the first prototype newspapers emerged, through Dr Johnson, the growth of the radical press in the early 19th century, the Lord Northcliffe revolution in the early 20th century, the newspapers wars of the 1930s and the rise of the tabloid in the 1970s, right up to Rupert Murdoch and the online revolution, the book explores the impact of the newspapers on our lives and its role in British society. Using lively and entertaining examples, Kevin Williams illustrates the changing form of the newspaper in its social, political, economic and cultural context. 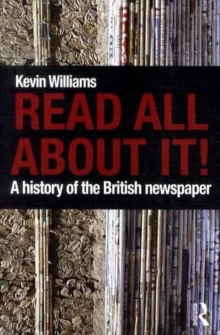 As well as telling the story of the newspaper, he explores key topics in detail, making this an ideal text for students of journalism and the British newspaper.